I am not an expert either in middle ages art, nor art in general, but I love to gather information and to get to know what the past generations left to posterity, anywhere in the world that I find myself. 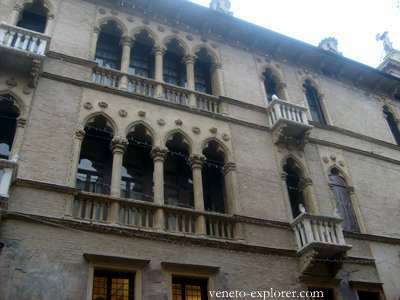 Therefore I don’t claim to explain in details every monument or masterpiece of Veneto. Just for Venice itself it would be at least a 5000 page website! There are many minor works of art in Veneto, referable to middle ages art or to other historic periods, often spread over towns and villages out the big tourism stream, often unknown even to locals. I am going to do nothing but give you some hints and suggestions on the most important must-see things in Veneto concerning the middle ages art. Of course if you are a savant or an art enthusiast, you might want to go deeper into the subject with a good art book. Veneto middle ages art stands out greatly in the architecture field, with the uniqueness of the venetian gothic. In many towns of Veneto, such as Vicenza, Treviso, Padua, and in some smaller towns whose name you probably have never heard of, you will notice strong influences from the venetian middle ages art and architecture. Don’t forget that Venice and the western mainland, plus Histria and part of Dalmatia and its islands (today’s Croatia), have been for centuries a community, i.e the Republic of Venice. One of the most recognizable medieval architectural features which you will see often even in the mainland ancient homes are the venetians gothic style windows, with the so called lancet or pointed arch. Born in the ninth century as a fortified castle surrounded by the sea water, the Doge’s Palace acquired the current features between 1300 and 1500. It’s a great symbol of the Venice middle ages art. It’s a unique building, supported by a series of arcades made in Histrian stone, surmounted by a two arcades loggia. If you pay attention, the european medieval architecture emphasizes verticality whether by the pointed arch, or by the pinnacles and spires, or by the narrowness or height of the buildings. You can often see this peculiarity of the time in churches and cathedrals, such as the Reims cathedral in France or the Milan cathedral, just to name a few. In the case of the Doge’s palace in Venice,instead, you have the feeling of a big emphasis on verticality put mainly on the lower part of the building, as if the palace was upside down. 8000 sq meters/86114 sq feet of mosaic on walls, arches and domes. The Venice Basilica, founded in the ninth century, is another majestic symbol of the capital of Veneto. On the exterior, it is a great example of architecture and art from the Middle Age influenced by the byzantine style. The interior too is a must-see, also for its grandeur and its suggestive shaded light. Over the centuries the Venetians had embellished it with paintings and works of art, sometimes brought from abroad, like the four copper horses placed until 1977 on the St Mark’s basilica loggia, that the Doge Enrico Dandolo let send from Constantinople as a war chest, at the end of the fourth crusade in 1204. The carbon-date estimates the horses to be very ancient, dating back to the second century A.D. Since 1977 the four horses that you see on the exterior of the Basilica are just a copy, the original ones having being placed in a museum, to preserve them better. Inside the basilica, you can see an amazing example of middle ages art influenced by the byzantine style. It’s about a very rich series of mosaics on the walls and on the main dome, dating back to 12th and 13th century. 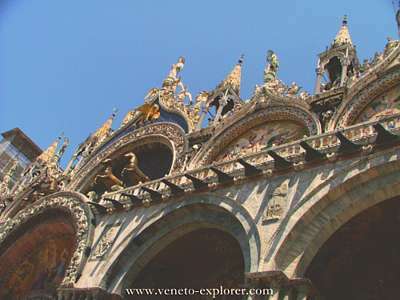 They depict the story of St Mark evangelist, the patron of Venice, and episodes of the Old and New Testament. On the floor, by now warped by the time and by the passage of millions visitors, you will see less garish stone mosaics, depicting geometric figures and animals. 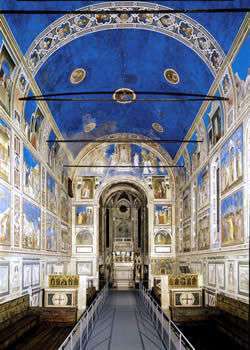 The Scrovegni Chapel is universally considered a true masterpiece, the quintessence of the european middle ages art. If you love the paintings, and happen to find yourself in Veneto, you cannot miss it. A very wealthy banker from Padua, Enrico Scrovegni, commissioned the work to a renown tuscan painter from Florence, Giotto. 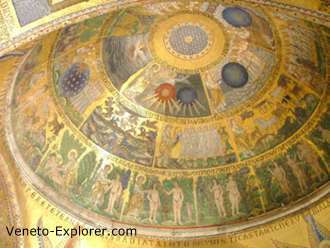 He painted the banker’s private dome vault chapel, which was located beside the no more existing banker’s palace. Giotto ended the frescos in 1306. Among others, you will see depicted the themes of the Salvation and the Last Judgment. Visits to the Scrovegni Chapel are strictly regulated. Only 25 people at a time are allowed to enter, after having stationed in a clearing chamber for 15 minutes, to not damage the microclimate of the chapel.